In a manger of love our Jesus was born, and in a cave He chose to visit our humanity. By His descending, the Lord experienced all our weaknesses except for the sin. He did not chose the scepters or the sofas of the rich in order to preach the salvation, but the womb of a Virgin. He put us on so that we could put Him on. He dwelt in a cave so we may become citizens of Heaven. Jesus came looking for the humanity that was wounded with Adam and strayed with Eve. His incarnation reminds us of dispensation. It is the stamp of the divine love that looks for censed souls, like Mary’s, that spread Creator’s scent worldwide. This is the case of Virgin Mary, the censor that spread the light of God for mankind. Let us put ourselves in her place, just once, and see how this girl fulfilled the will of God, and how she became an example for us in all our troubles, even 2000 years after the coming of our Lord. Mary was not one of those earthly “mighties.” But she was a mighty in her prayer. She was not of a high class, but a girl of a humble love who obeyed God’s order. She did not complain thinking about her reputation, and she was not ashamed of getting pregnant of the Holy Spirit. Mary, the Galilaean, did not complain of the distress that happened in those days, which looks like the distress that takes place nowadays. On the contrary, she was armored with God. She was not ashamed of her Son’s Cross, but she accompanied Him to the Golgotha, and she cried, just like us, over the tyranny of the falsehood. Mary is one of many, who see the nails of falsehood being beaten in truth’s body just like those nails which were beaten in Jesus’s hands. But Mary did not deny her God the way some of us do today, seeing how darkness is overwhelming the light. She did not ask: where is God? Cannot He watch the sorrow of my heart? But, she said: God is the strength of my heart. Surely, Mary is a human, just like us. And surely, we may cry just like her. But the strength and the uniqueness of this Virgin is the fact that she did not let the sorrow overcome the hope. She was not afraid of putting her hope in God. And we are called upon to behave the same way in these difficult days in which we pass as humans, community, country, and the whole East. We are called upon nowadays to be united, and to follow the example of Virgin Mary and all the disciples. Their unity was mixed with an undoubted hope in God Who had gained victory over death. They buried fear because of their unity and love. And we are called upon, as much as possible, to bury our afflictions by keeping the unity of souls and hearts regardless of the geographical distances. Antioch is those hearts that are tied to Jesus. Before these bounds egoism, races, cracks, and disputes melt out in order to make Jesus shine on the front. We, as the Christians of the East, are called upon to contemplate Jesus, Who did not incarnate in days better than ours. Because of His love we put on His name first in Antioch, and with the power of His Cross our ancestors lived on this land. We are on it and we come from it. We were born from its womb and we will be buried in it. We are staying here, and we will carry our cross following the example of our Lord. 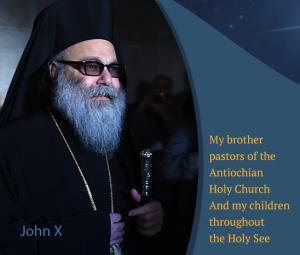 And to those who abduct our people and bishops we say: We are a part of this East. In it we live together with our brothers from all religions. We won’t spare an effort to remain in this land defending our history and existence. We pray today for the peace in Syria, and for stability in Lebanon. We pray for the suffering East, for the bleeding Palestine. We pray for the homeless, for the displaced, for the lost, for the abducted, and for the martyr. We pray to Virgin Mary to send peace to the souls, because it is the seed of peace on earth. We pray to protect all her abducted children, amongst them the two bishops of Aleppo, Youhanna Ibraheem and Boulos Yazigi. We pray to her to be with our people everywhere bestowing humanity the mercy of the Child of peace and the Father of mercies.